When two or more people joins hands with a common goal to attain profits. Every partner invests either time, money or his patents to help partnership firm to reap profits. There are many problems in partnerships regarding profit shares, investment period etc. I will try to solve one question from each part. Raj invested Rs 76000 in a business. After few months Monty joined him and invests Rs 57000. At the end of year both of them share the profits at the ratio of 2:1. After how many months Monty joined Raj ? Raj invested Rs 76,000 for 12 months and Monty invested Rs 57,000 for x months. So Monty invested his money for 8 months and he joined after 4 months. A and B started a business by investing money in ratio of 5:6. C joined them after few months by sharing an amount equal to B's share. At the end of year 20% profit was earned which was equal equal to Rs 98,000. How much money was invested by C ? A, B and C shared profits in ratio of 5:7:8. They partnered for 14 months, 8 months and 7 months respectively. What was he ratio of their investments ? 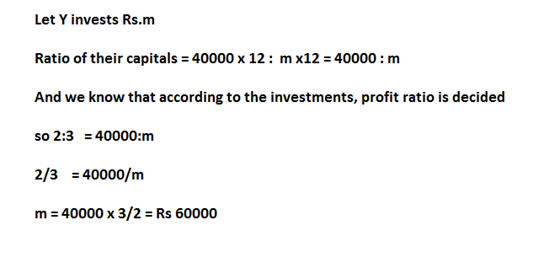 Solution - Simply multiply profit sharing ratio with investment ratio to get investment amount ratio. Sita and Geeta started a business by investing Rs. 120000 and Rs.135000 respectively. Find the share of each out of an annual profit of Rs. 35700. When investors are there for the different duration of time in the business , then the investments are calculated for a unit of time by having ( investment x number of units of time) . Now gain or loss is divided in the ratio of these investments. Ravi started a business by investing Rs.36000. After 3 months Shayam joined him by investing Rs.36000. Find the share of each in the annual profit of Rs. 37100. Sony , Mony and Tony start a business each investing Rs.20000. 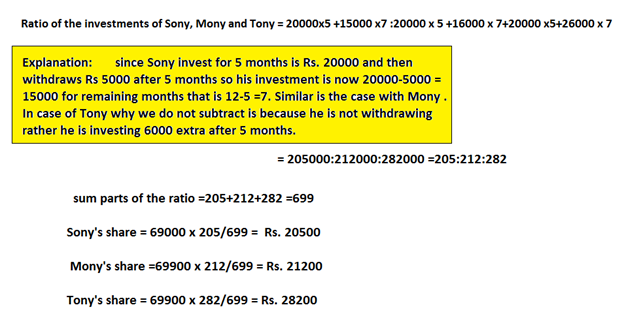 After 5 months Sony withdrew Rs.5000, Mony withdrew Rs.4000 and Tony added Rs.6000 more. At the end of the year, a total profit Of Rs. 69900 was recorded. Find the share of each? Sheela started a business with Rs. 21000 and is joined afterwords by Reema with Rs 36000. 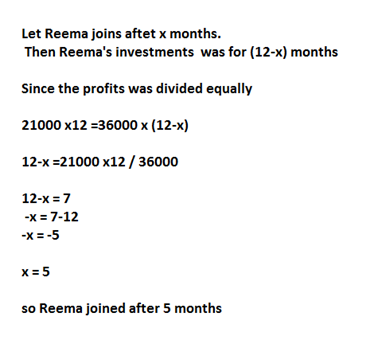 After how many months did Reema join if the profits at the end of the year are divided equally? X and Y invested in a business. They earned some profit which they divided in the ratio of 2:3. If X invested Rs. 40000. 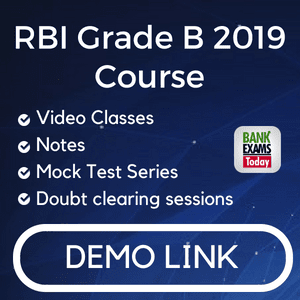 Find the amount invested by Y? 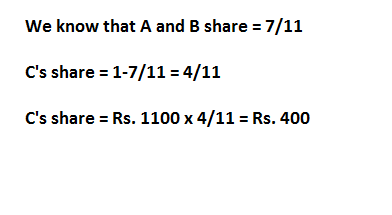 A , B , C contract a work for Rs .1100.A and B together are to do 7/11 of the work . What is C’s share ? Mohinder and Surinder entered into a partnership investing Rs. 12000 and Rs. 9000 respectively . After 3 months , Sudhir joined them with an investment of Rs.15000. What is the share of Sudhir in a half yearly profit of Rs. 9500? In a partnership , A invests 1/6 of the capital for 1/6 of the time , B invests 1/3 of the capital for 1/3 of the time and C , the rest of the capital for the whole time. What is the share of B in the profit f Rs. 4600. Solution - Let the first partner invests Rs x for 14 months, second partner invests Rs.y for 8 months, Rs z for 7 months. 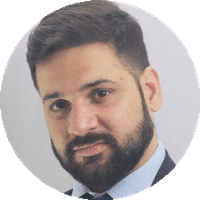 Navdeep, Rahul and Raj entered into a partnership Navdeep invested Rs. 16000 for 9 months. Rahul invested Rs. 12000 for 6 months and Raj invested Rs. 8000 for 12 months. At the end of a year there was a profit of Rs. 26000. Find the share of Rahul in the profit. Divya starts business with Rs. 3500 and 5 months after Jyoti joins Divya as her partner. After a year the profits are divided in the ratio of 2:3. How much did Jyoti contribute? Aman began a business with Rs. 550 and was joined afterwards by Rahul with Rs. 330. 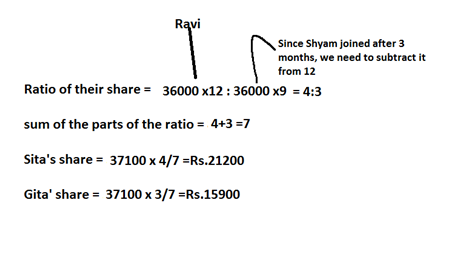 When did Rahul join if the profits at the end of the year were divided in the ratio 10:3? A, B and C invested capitals in the ratio 3:5:9; the timing of their investments being in the ratio 2:3 1. In what ratio would their profits be distributed? A, B, C and D enter into partnership, A subscribes 1/3 of the capital, B 1/4, C 1/5 and D the rest. 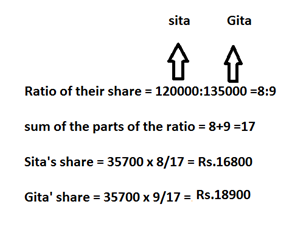 What is the share of D out of a profit of Rs. 6000? A starts business with a capital of Rs. 1200. B and C join with some investments after 3 and 6 months, respectively. If at the end of a year, the profit is divided in the ratio 2:3:5 respectively, what is B's investment in the business? or, x= 42000✕3/2✕7= Rs. 9000. Jyoti's Contribution is Rs. 9000. Thus A, B and C invested their captains in the ratio 12 : 10 : 6. Try to increase your speed. Remember you need to solve at least 1 question in a minute. Thank you for the guidance Sir. 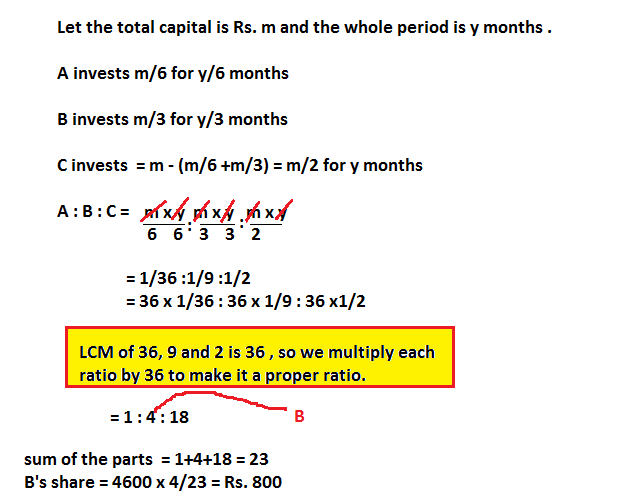 In the 2nd prob, I did not get how, C=6*6 when the no.of months C invested for is not mentioned in the question. Also could you please elaborate the last step in the same prob? Same with the last prob. I did not understand how you arrive at the final investment ratio with the 3 implications. Let their investments be Rs. x for 14 months, Rs. y for 8 months and Rs. z for 7 months respectively..
and 14x/7z = 5/8 ---> z= (16/5)x. Thanks Chidipilli, noticing that you are answering many queries. Thanks a lot for helping me. Now I get it. Thank you soo much MOHANAVAMSI CHIDIPILLI. Oh! But I still did not get the last step of the 1st prob. Please help. Money invested per month is calculated. Monty's invested money for 8 months, thus he joined after 4 months. 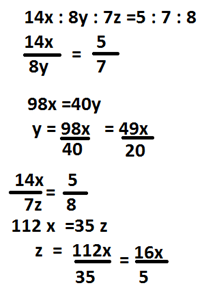 In the 2nd problem , how you put 6X6 even there are nothig clear about the c that he invested for how many months ??? Hi In the second problem can you please explain why you multiplied with 2 again? 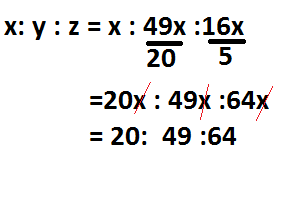 I mean 490000*36/168 is enough why again it is multiplied by 2? Thanks Ramandeep Singh :) well explained, I easily understand the problem . . .